Disaster Recovery : "Data ?" When Finsys gives you all information at your fingertips. It is also imperative for you to take care of Finsys Data security. But I do remember a case, where the computer server was "Formatted" by Computer AMC person, and the data backup taken by the client was in the same hard disk. ((( a big blunder .. since after that formating, that so called backup was also lost... almost permanendly ))) This is a true story from Sector25, Faridabad. Another bad story is a case of Fire at a client of ours. And one more is about a Theft at a Sector-59 Factory of a client , where the thief took away Fax machines, photocopier, computers, and other costly office equipment. And sadly the data backup was only inside those computers. So, You must know that Finsys Team is there to help you, but Data is something Privy to your company and you and only you can protect is diligently and properly. Disaster can be classified in two broad categories. Viz, 1) Natural disasters—Preventing a natural disaster is very difficult, but it is possible to take precautions to avoid losses. These disasters include flood, fire, earthquake, hurricane, etc 2) Man made disasters—These disasters are major reasons for failure. Human error and intervention may be intentional or unintentional which can cause massive failures such as loss of communication and utility. These disasters include accidents, walkouts, sabotage, burglary, virus, intrusion, etc. Identify the scope and boundaries of business continuity plan. First step enables us to define scope of BCP. It provides an idea for limitations and boundaries of plan. It also includes audit and risk analysis reports for institution’s assets. Sell the concept of BCP to upper management and obtain organizational and financial commitment. Convincing senior management to approve BCP/DRP is key task. It is very important for security professionals to get approval for plan from upper management to bring it to effect. Each department will need to understand its role in plan and support to maintain it. In case of disaster, each department has to be prepared for the action. To recover and to protect the critical functions, each department has to understand the plan and follow it accordingly. It is also important for each department to help in the creation and maintenance of its portion of the plan. The BCP project team must implement the plan. After approval from upper management plan should be maintained and implemented. Implementation team should follow the guidelines procedures in plan. NIST tool set can be used for doing BCP. National Institute of Standards and Technologies has published tools which can help in creating BCP. With the increasing importance of information technology for the continuation of business critical functions, combined with a transition to an around-the-clock economy, the importance of protecting an organization's data and IT infrastructure in the event of a disruptive situation has become an increasing and more visible business priority in recent years. It is estimated that most large companies spend between 2% and 4% of their IT budget on disaster recovery planning, with the aim of avoiding larger losses in the event that the business cannot continue to function due to loss of IT infrastructure and data. Of companies that had a major loss of business data, 43% never reopen, 51% close within two years, and only 6% will survive long-term. This results in a majority of failed businesses. Preventive measures - These controls are aimed at preventing an event from occurring. Detective measures - These controls are aimed at detecting or discovering unwanted events. Corrective measures - These controls are aimed at correcting or restoring the system after disaster or event. Prior to selecting a disaster recovery strategy, a disaster recovery planner should refer to their organization's business continuity plan which should indicate the key metrics of recovery point objective (RPO) and recovery time objective (RTO) for various business processes (such as the process to run payroll, generate an order, etc). The metrics specified for the business processes must then be mapped to the underlying IT systems and infrastructure that support those processes. Once the RTO and RPO metrics have been mapped to IT infrastructure, the DR planner can determine the most suitable recovery strategy for each system. An important note here however is that the business ultimately sets the IT budget and therefore the RTO and RPO metrics need to fit with the available budget. While most business unit heads would like zero data loss and zero time loss, the cost associated with that level of protection may make the desired high availability solutions impractical. The following is a list of the most common strategies for data protection. In many cases, an organization may elect to use an outsourced disaster recovery provider to provide a stand-by site and systems rather than using their own remote facilities. Harney, J.(2004). Business continuity and disaster recovery: Back up or shut down. AIIM E-Doc Magazine, 18(4), 42-48. Dimattia, S. (November 15, 2001).Planning for Continuity. Library Journal,32-34. This other location can be your other factory , or your Head office , or even MD's Residence. Further, you may make a DVD instead of a CD. Just as a disaster is an event that makes the continuation of normal functions impossible, a disaster recovery plan consists of the precautions taken so that the effects of a disaster will be minimized, and the organization will be able to either maintain or quickly resume mission-critical functions. Typically, disaster recovery planning involves an analysis of business processes and continuity needs; it may also include a significant focus on disaster prevention. 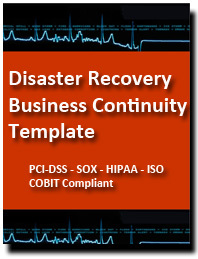 The Disaster Recovery Planning Template (DRP) can be used for any sized enterprise. click this icon to access the propreitory information by Janco Associates, Inc, USA. You may order for templates online from their site.